Ladies Day at Southport Flowershow raises over £2,500 for CLF | Making a positive difference! Fashion and flowers were the order of the day for Ladies Day at Southport Flower Show with Community Link Foundation as the chosen charity for the event. The event, held on Friday, August 19, is becoming a firm favourite in the calendar of local ladies, and this year it raised £1275 for Community Link Foundation through a raffle on the day. Staff from the Royal Bank of Scotland’s Southport branch came to help with the making up of goodie bags for each of the guests and collecting all the raffle tickets and they very kindly donated £1250 to CLF. This year’s event, sponsored by Smooth FM, had a record attendance with 300 ladies gathering for a champagne reception, sponsored by Dr Hennessy Cosmetics. Amanda Neale entertained the guests as they arrived, and magician David Burgess kept ladies entertained throughout the day. There were also flamenco dancers, belly dancers, a stilt walker and singing waiters who stole the show when they swapped menus for microphones. 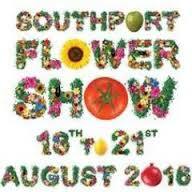 Karen Watkins, from Southport Flower Show, said: “It was a wonderful day and all the ladies looked fabulous and the amazing Mr Paul Crone and Claire Simmo did a wonderful job hosting the show. The title of Best Dressed Lady 2016 went to Pat Allen from Formby who looked stunning in her royal blue dress and hat. Tables are already on sale for 2017 so for more information call Karen Watkins on 01704 547147. For more information on Community Link Foundation go to www.clfoundation.co.uk.